V e g a n P a n d a m o n i u m: Dinner and a Movie! This isn't technically a "recipe" per se... but instead it's more like a cute dinner idea. Anyways, a couple weeks ago, my mom and I had a marathon of the new HBO mini series, Mildred Pierce. 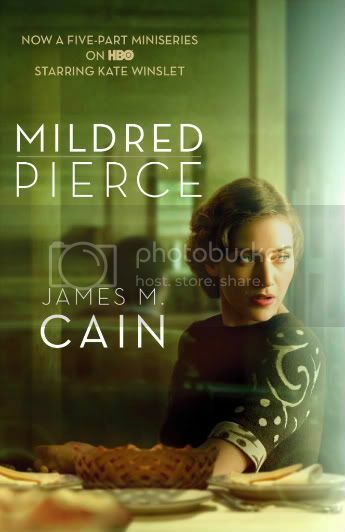 The series has five parts and is about Mildred Pierce (played by Kate Winslet), a single mother who takes a job as a waitress during the depression to take care of her two daughters. Her love of cooking develops into her own restaurant where she features only two dinner options: chicken & waffles or chicken & vegetables. As my mom and I sat there getting hungrier and hungrier, I realized I had everything to whip up a vegan version of what we were seeing on screen! I baked Gardein's Chiptole Lime Crispy Fingers until crispy and sauteed with some BBQ sauce. I threw some frozen vegan waffles in the toaster and then I steamed some corn, broccoli, carrots and mushrooms in a pan. 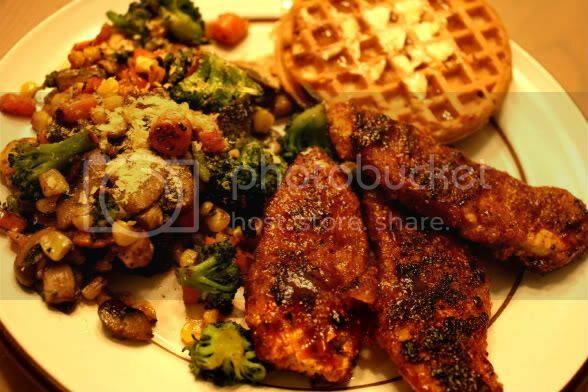 I added some Earth Balance, s&p and nutritional yeast to the veggies, topped the waffles with maple syrup and voila! That series looks so good! I love Kate Winslet! I haven't tried the Chipotle lime Gardein yet, can't wait! i haven't seen the miniseries yet, just the original movie (with joan crawford). but i recently went to a place that served chicken & waffles and they were to die for! can't wait to try it on my own. watching this show made me want pie and chicken and waffles like no other...it was a great series too!! !